Find fun tours & activities in Zadar! There is only one international ferry to Zadar and that is the Ancona to Zadar line which runs from June to September. Zadar does not have a ferry connection to other towns on the Dalmatian coast but there is a passenger ferry that connects Zadar to Pula on the Istrian coast all year. The service is Friday only in winter. See the schedule. 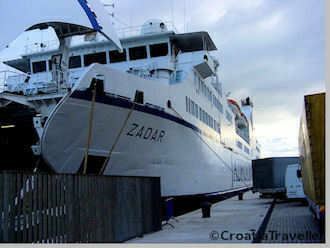 Also from northern Croatia is Jadrolinija's year-round car ferry between Mali Losinj and Zadar. as well as other islands in the Zadar archipelago: Rava, Iz, Molat, Brgulje, Zapuntel, Ist, Zverinac, Sestrunj, Rivanj. Local car and passenger ferries to Zadar are entirely handled by Jadrolinija with Miatours handling a daily passenger boat to Olib, Silba and Premuda. All Jadrolinija ferries can be booked online but tickets for the Miatours passenger boat must be purchased at the Miatours agency. Zadar has two ferry ports: the City Port and the new Gazenica Port opened in 2014 for cruise ships and in 2015 for local ferries (see more). The City Port handles the Ancona Zadar ferry and all passenger ferries while Gazenica handles all local car ferries. There is parking, car rental and taxis at the port. Additionally, the port is served by bus line 9, running at least every 30 minutes to the Zadar bus station where there are connections to local, domestic and international buses. See more about Zadar buses and check out bus schedules at Liburnia.